Welcome to Crystal Dynasty Pageant Message Board ! 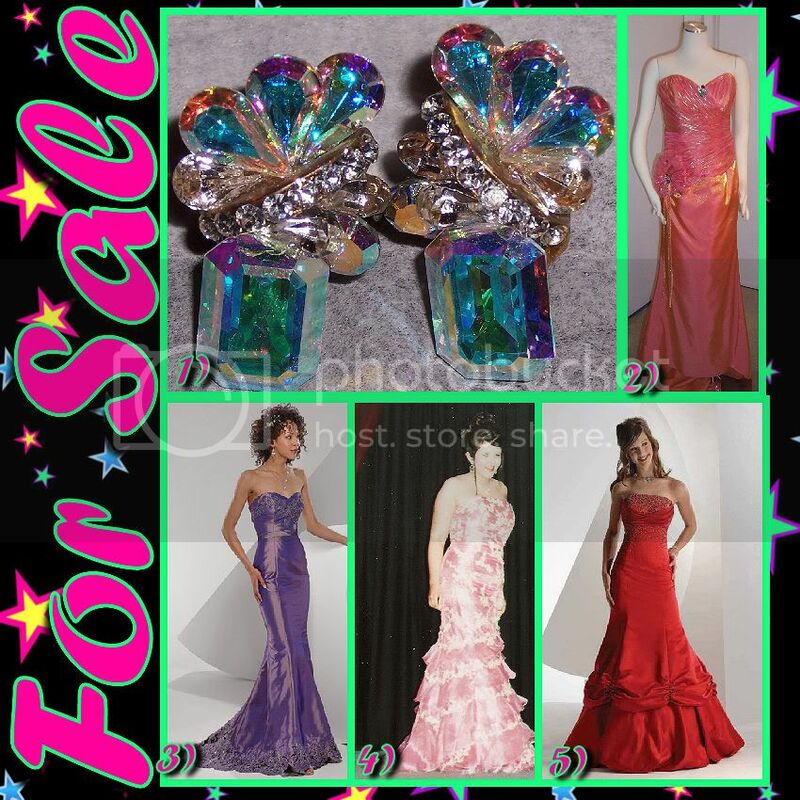 Post Congratulations, Wanted/Sale Items, Upcoming Events..
Pageants start at 10:00 a.m. Nothing added at the door. The first 5 entries will receive a nice gift. Be one of the 1st Amazing Angels Royalty!! Over 30 State Titles to be given away! Plus Beautiful Crowns, Custom Sashes, and Nice Gifts! SHERATON GATEWAY HOTEL ATLANTA, GA!! YOU MUST ENTER BY OR BEFORE MARCH 17TH!!! 1. ENTER THE WORKS BY YOURSELF FOR THE SPECIAL PRICE OF $520.00!!! SUPREME PACKAGE AND REGISTRATION FEE INCLUDED. ALSO INCLUDES ALL EVENTS ON YOUR NATIONAL ENTRY FORM. 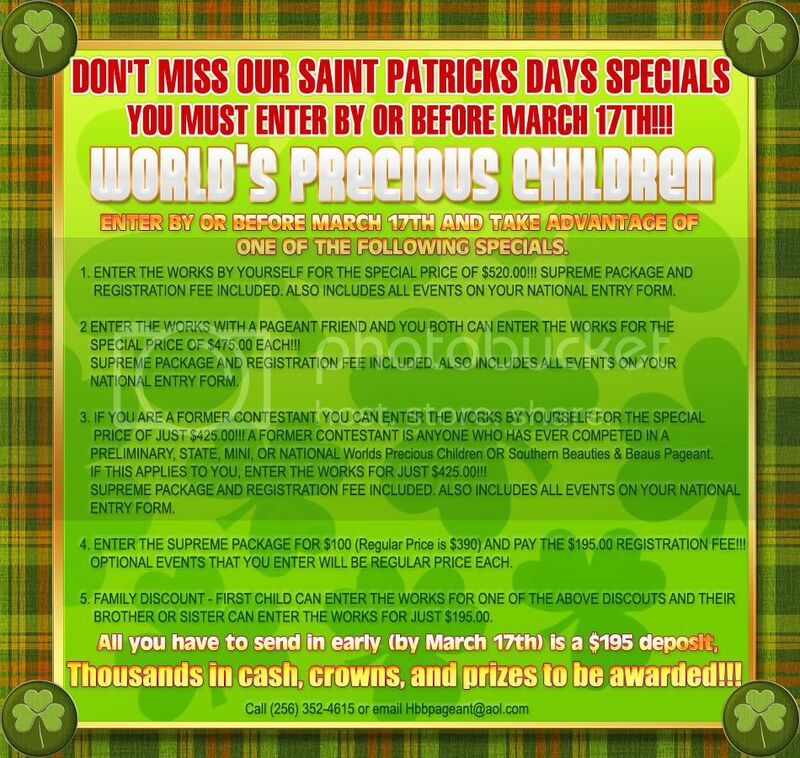 2 ENTER THE WORKS WITH A PAGEANT FRIEND AND YOU BOTH CAN ENTER THE WORKS FOR THE SPECIAL PRICE OF $475.00 EACH!!! SUPREME PACKAGE AND REGISTRATION FEE INCLUDED. ALSO INCLUDES ALL EVENTS ON YOUR NATIONAL ENTRY FORM. 3. IF YOU ARE A FORMER CONTESTANT, YOU CAN ENTER THE WORKS BY YOURSELF FOR THE SPECIAL PRICE OF JUST $425.00!!! A FORMER CONTESTANT IS ANYONE WHO HAS EVER COMPETED IN A PRELIMINARY, STATE, MINI, OR NATIONAL Worlds Precious Children OR Southern Beauties & Beaus Pageant. IF THIS APPLIES TO YOU, ENTER THE WORKS FOR JUST $425.00!!! 4. ENTER THE SUPREME PACKAGE FOR $100 (Regular Price is $390) AND PAY THE $195.00 REGISTRATION FEE!!! OPTIONAL EVENTS THAT YOU ENTER WILL BE REGULAR PRICE EACH. 5. FAMILY DISCOUNT - FIRST CHILD CAN ENTER THE WORKS FOR ONE OF THE ABOVE DISCOUTS AND THEIR BROTHER OR SISTER CAN ENTER THE WORKS FOR JUST $195.00. Thousands in cash, crowns, and prizes to be awarded!!!!! 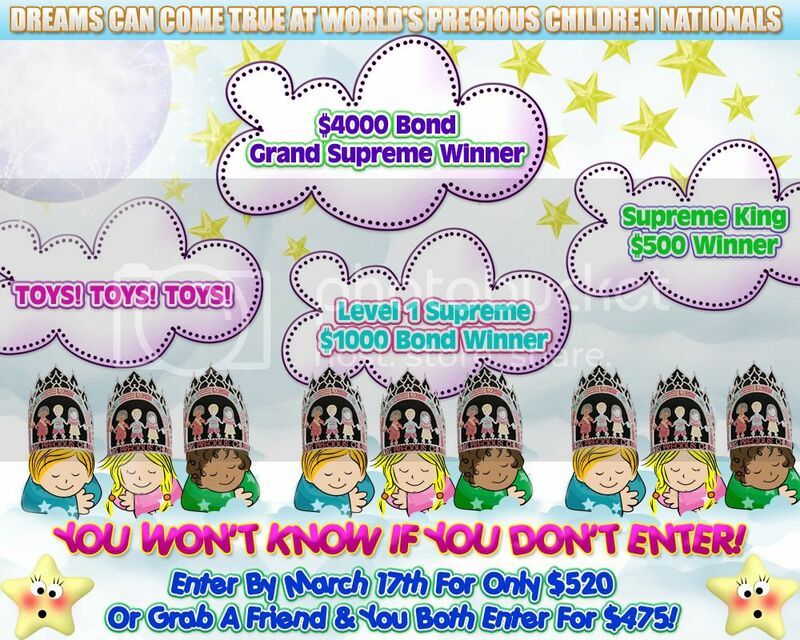 WORLD'S PRECIOUS CHILDREN NATIONALS MAY 14TH - 16TH!! SAVE $$$$ ENTER BY MARCH 17TH!!! Take Advantage Of Our Specials Enter By March 17th For Only $520!! Or Grab A Friend & You Both Enter For $475!!! YOU WON'T KNOW IF YOU DON'T ENTER!!! IF YOU DO PLAN TO ATTEND PLEASE SEND ME YOUR APPLICATIONS AND PROGRAM BOOK PICTURES. OUR FIRST EARLY BIRD HAS ENDED.. OUR SECOND EARLY BIRD IS $450 AND INCLUDES ALL EVENTS AND REGISTRATION FEE.. SECOND EARLY BIRD WILL END ON MARCH 1, 2010. THESE EARLY BIRDS WILL NOT BE EXTENDED. CAN'T SEND IN THE FULL DEPOSIT AMOUNT?? NO PROBLEM WE UNDERSTAND TIMES ARE TOUGH SO JUST SEND IN A SMALL DEPOSIT TO HOLD YOUR SPOT. I WOULD HATE TO SEE SOMEONE MISS OUT ON THE SAVINGS. SOMEONE WILL GO HOME WITH A TRIP TO UNIVERSAL STUDIOS FLORIDA, $1000 BOND, AND SO MUCH MORE. YOU COULD ALSO TAKE HOME THE PUPPY. ALL THIS IN ADDITION TO ALL THE GORGEOUS CUSTOM FULL DIAMOND CROWNS, CUSTOM EMBROIDERED SASHES, BAGS OF GIFTS, PERSONALIZED GIFTS, TOYS, JEWELRY, SAVINGS BONDS AND SOOOOO MUCH MORE. IT'S ALL HAPPENING AT THIS YEARS NATIONAL EVENT. WE'LL ALL BE THERE WILL YOU??? 12" Custom Horse Crown, Monogrammed Banner & Gift!!! The Dixie National Rodeo Parade On Saturday Morning!! One Queen Chosen from each State!! These States Closed - Already have winners!! YOU DO NOT HAVE TO ATTEND NATIONALS TO ENTER! ON OUR WEB SITE AND IN THE NATIONAL PROGRAM BOOK!! Compete glitz, natural.. or BOTH! Come join the fun at our Mardi Gras Pageant! Save BIG by doing both pageants! 66 Titles to be won! Plus you can enter all 13 door titles for just $40.00! We will have 2 sets of judges at this state finals. $100.00 deposit for doing both pageants, Natural State and Semi-Glitz State Finals. Games and Refreshments are provided!! If you want to be added to the list, please e-mail me. 2010 Theme is Mardi Gras: Party after competition on Sat. night!! PAY IN FULL BY JAN. 12, AND RECEIVE DOOR TITLES FOR FREE!! SAVE BIG WITH THIS SPECIAL!! 66 Titles in all for both pageants!!! Everyone receives a nice gift and a crown/tiara. No one goes home empty handed. Please check our website to see what special we are offering at each location. For Only $300 Plus Shipping! Mention This Add, Good From Dec 3 - Dec 10Th ONLY!! Choose the style that fits you NATURAL or GLITZ we have both! Enter by Oct. 31 and get 10 extra chances at winning a puppy! Enter the photo contest between Oct. 20-Oct. 31 and get 10 more shots at winning a puppy! Photo contest begins now and ends Nov. 20. Winners announced Nov. 22. 1st photo $50 extra photos $10 each. Up to 8 for $75 paypal accepted. OF THE WORLDS FAVORITE, VACATION DESTINATIONS! we need Calendar Girls for each month. Accepting Glitz, Natural, Composite and Print Model Photos! will receive the Supreme Package paid to Nationals! November 20 - 22nd in Pigeon Forge, TN!!! Christmas Gift on stage at Nationals. 1 Calendar Girl will also receive a puppy or $300 Cash, your choice. Where are all the 0-2 year Contestants???? Click on the banner and visit our website! Check out all of our National Titles! Join us for the Christmas Event of the year!! We have extended our $875 Package Deal for all events until November 5th! Many ways to win fees off still available! One Day Event Hosted By Mr. Tim!!! The Most Beautiful Christmas Pageant in the Country for the Lowest Entry Fee! $245 Qualifies You for Supremes. No Registration Fee. Includes Extra Door Pass!!! Call Today Toll Free for Paperwork: (866) 539-3051! Only East Coast USA Can Bring You the Magic of Christmas Like This! MORE DATES TO BE ADDED!! Get your Series or Portfolio Print for FREE!!!! Offer will not be repeated, ends at AGG! The winner will receive a National Crown, Monogrammed Banner, $200 Bond and a huge Christmas Stocking full of wrapped Christmas Gifts. Four alternate photos will appear on the back cover and will be awarded a Christmas Gift!!! Deadline to enter is October 20th! Don't miss it! You can't win if you don't enter!! Click on the banner for your on-line National Entry Form!! Get your place in line-up! HUGE Christmas Stocking full of wrapped Christmas Gifts. WHAT MORE CAN YOU ASK FOR??? Click on the banner for your entry form!!! The $795 Package Deal has been EXTENDED!! Did you miss the deadline??? You can still do all events for $795! Is September 15th, DON'T MISS IT!!! Click on the banner and visit our website, on-line entry form is available! 1) Cottontail Originals size 6-9 mo. comes with shoes and 2 hairbows. 2)9mo-18 mo yellow and blue gingham swinsuit. 3)18mo-3T blue with white polka dot 2 piece swimsuit. 4)2T-4T yellow babydoll dress made by Tina Marshall. 5)18mo-2T blue babydoll dress made by Tina Marshall. Join us on October 24 in Panama City and you will see for yourself why RQA is the talk of the pageant world. Here are just a few things that you can expect from RQA. 4. Ways that you could win all your pageant fees paid, fees off and prizes. 6. We NEVER PRO RATE! 8. EVERY CONTEST receives a crown, sash and bag of gifts. 10. ONLY 7 CONTESTANT IN YOUR AGE GROUP! IF YOU WANT A CHANCE TO COMPETE AND HAVE A SUPER FUN WEEKEND ON THE BEACH BE SURE TO GET YOUR DEPOSIT IN TO HOLD YOUR SPOT. REMEMBER ONLY 7 IS ALLOWED IN EACH AGE GROUP. NO PHOTOS REQUIRED FOR BEAUTY PAGEANT! Join RQA, The Shriners & Patsy's for a Spook-Tac-U-Lar Good Time! See our web site for all the cool contest & cash awards for this super FUN Halloween Pageant!! HURRY! �LAST DAY THAT WE WILL EXCEPT ENTRIES IS OCTOBER 1ST! NO MATTER HOW MANY CONTESTANTS ARE ENTERED. As of September 21. �ALL Age groups are open and some only have only 1 Contestant entered. WE NEVER PRO RATE!! ALL CASH AND PRIZES WILL BE GIVEN OUT! I Know times are tuff. If you can't come to our Halloween Pageant you can still help the Shriners. Please visit our web site for many ways that you can help. Even small donations add up! 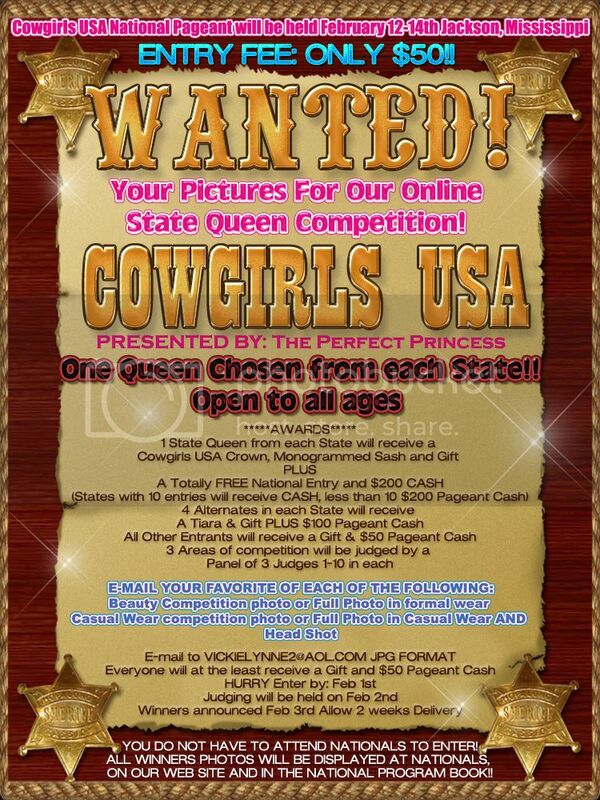 Please visit our web site at www.royalqueensofamerica.com for information about RQA and this super fun pageant and ways to win fees & prizes! Important reminder. We only take 7 contests in each age group. Do to us giving all the girls crowns and bags of gifts we have a cut off date of September 20. So that we can have everything ordered and delivered on time. We will not except any deposits after this date. Not even if the groups are not full. So PLEASE get your deposit in by this date. SHERATON GATEWAY HOTEL - ATLANTA, GA!! Our BEAUTIFUL 10-12 Year Royalty Welcomes You To SBB!!!! AND SAVINGS BONDS TO BE AWARDED!!! Click on the banner to visit our web site or call (256) 352-4615 or email Hbbpageant@aol.com!! OCTOBER 9TH - 11TH MR. TIM WILL BE THERE TO WELCOME YOU!!! EVERYONE A FREE HOTEL NIGHT AND A FREE DOOR BADGE IF YOU ENTER THE WORKS BY AUGUST 31ST!!!! YOU CAN ENTER THE WORKS FOR JUST $650 IF YOU ENTER BY AUGUST 31ST!!! THOUSANDS IN PRIZES AND CASH TO BE GIVEN AWAY!! OUR SBB CROWNS ARE GORGEOUS!!! Please e-mail me if more pics are needed . Get Rid Of Those Unused Pageant Clothes: And Make Some Summer Money! 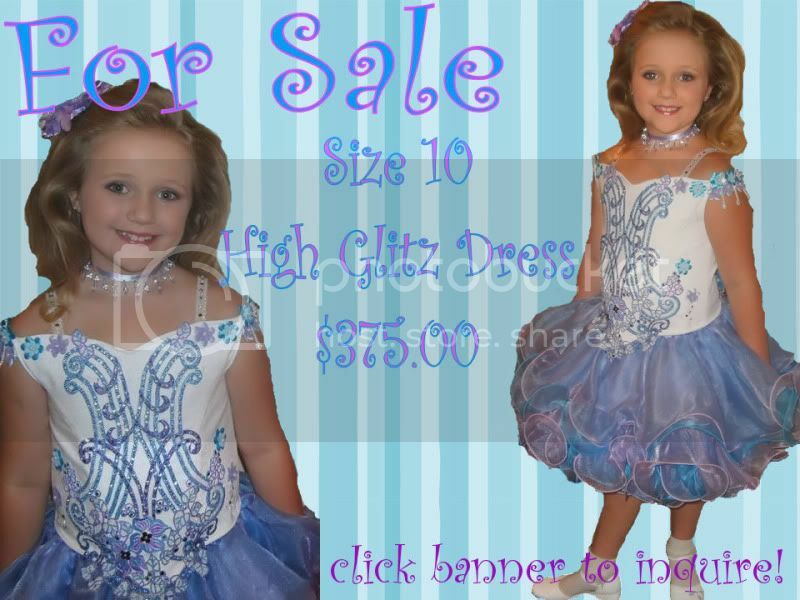 For Sale : Size 10 � 2 tone blue & purple semi glitz pageant dress. layered cupcake skirt, choker, hair bow and flowers instead of a bustle. My DD has only worn this dress once on stage and she was 1st runner up. The price is $375.00; please email me with your questions and for the measurements. 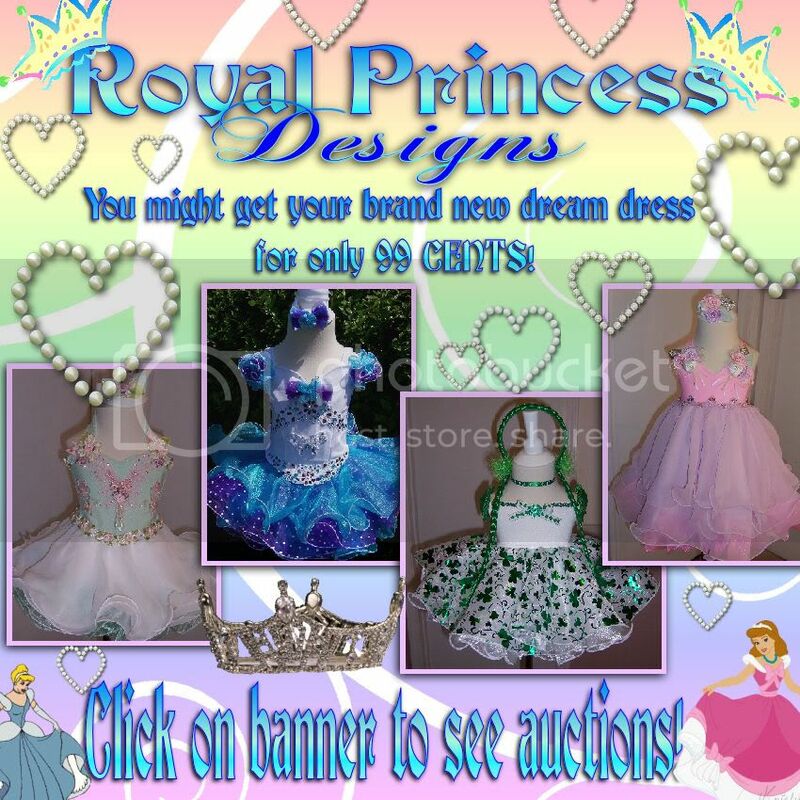 You might get your brand new dream dress for only 99 CENTS! Click on banner to see auctions! We have tons of wrapped Christmas Gifts for all Contestants not just the Winners. Beautiful Custom AGG Crowns, Huge Christmas Stockings and so much more!!!! $695 for all events! Ends July 31st!!!! November 20-22nd in Pigeon Forge, TN! Click on the banner and check out our website! National Paperwork is now available!! Save $$$$$ by entering one of our Package Deals!!! Don't miss the Christmas Event of the Year!!!! ** OPP ~ Discover what your competition already knows! CompCard Special ~ Limited Time Offer! Centerfold Comp-Card Special Open to Everyone for a Limited Time!